Have an ancient GE on hand that we still use periodically ; the compressor only needs to run for a few minutes every couple of hours because it stays so cold. The icebox part is very small. It is quiet and efficient and not as large as modern units. We had an old Hotpoint refrigerator with the latching handle. I think my parents bought it in 1950 right after they got married. It had a small freezer section that took up about one-half of the top shelf, and always seemed to need defrosting. When I think of the size of my "standard" refrigerator today, I don't know how we managed with a family of eight and that little fridge. That thing ran forever. When we finally upgraded to a larger model, the old Hotpoint went to the basement as an auxiliary fridge. After my parents passed away and the house was sold in '09, we gave it away. It was ugly to look at with rust on it from being in the basement, but it was still running just fine!. Probably not very energy efficient though. Remember when home refrigerators (like many commercial units to this day) had handles that had to be pulled or lifted in order to unlatch and open the fridge door? I think these were discontinued for safety reasons; children were known to play with discarded refrigerators and get locked inside. 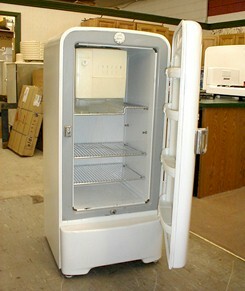 We had a Crosley fridge with such a handle. My parents went on a trip when I was about 15, leaving my grandmother (who spoke little English) to take care of me and my 11-year-old sister. The Crosley's handle broke and we couldn't open the fridge. We called an appliance repair guy, who located a replacement handle in a couple of days, but the service call ate up most of the cash my parents had left for us and we had to count pennies until they returned home. My parents had a 1932 General Electric refrigerator that was still running in 2003 when I gave it to a neighbor when I moved.